It’s back to school time! That may or may not be exciting for all parties involved–we’re looking at you, Mom.The fact remains that the kiddies will need a lunch to eat away from home. 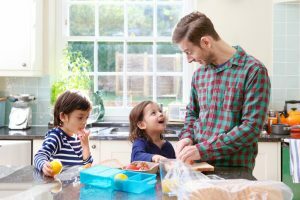 If you’re a lunch packer, your Westchester dentist has a few tips on how to pack a healthy, teeth-friendly lunch that the kids will enjoy. When we’re talking about oral hygiene, most people think about how often they brush or floss, or how often they go to the dentist. But many don’t consider how their diet can have a big impact on their oral health. There are foods that can really damage teeth and make those trips to the dentist less than fun. But, there are many foods that are great for your body and your teeth. Learn about what to pack from your Westchester dentist here. Try to pack as much fresh stuff as possible. Fruits and vegetables are great for lunches. They can be cut into finger foods, and are easily eaten raw (no cook time!). If your kids don’t love to eat what’s good for them, make the fruits and veggies more palatable by pairing them with dips. You can make homemade veggie dips by combining plain yogurt and other vegetables in a food processor. You can also buy healthy insta-dips. For the fruit, pair it with some fruity yogurt for dipping. Some of the best dentists in Westchester also want you to make sure that you choose yogurts that are low in sugar. Try to also include some whole grains, like bread spread with natural peanut butter, different varieties of cooked rice (not white) with chicken (also good cold! ), or toasted flaxseed on avocado. There are lots of crackers that are made from whole grains, too. You can also include proteins, like hard-boiled eggs or nuts. Try to stay away from packing foods that are sticky or gummy, since that generally means they are mostly sugar. Same goes for lots of packable kids’ drinks, like juice boxes and cans of soda. While some of the juices may be 100% fruit juice, it’s still a lot of sugar, and can wreak havoc on young teeth. Make sure you check labels for the amount of sugar in your foods, since kids only get one set of permanent teeth! It’s usually best to stick with bottled water. Come see your Westchester dentist for your next checkup and keep those smiles ready for school picture day! Our friendly office staff is happy to answer any questions you may have. Schedule an appointment with us today.